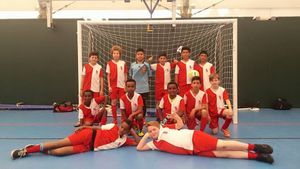 Futsal Club Enfield Youth Section offers futsal coaching sessions to boys and girls between the ages of 7 and 14 years. We have futsal qualified coaches that allow your child to learn the skils to play the game of futsal. WHO DO WE RUN SESSIONS FOR? FRIDAY: David Lloyds Leisure Centre, Carterhatch Lane, Enfield, Middlesex, EN1 4LF.